Lakhota & Kotho [palaces, Jamnagar]. bl.uk > Online Gallery Home	> Online exhibitions	> Asia, Pacific and Africa Collections	> Lakhota & Kotho [palaces, Jamnagar]. 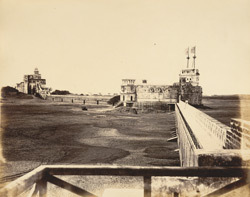 Photograph of Lakhota & Kotho palaces in Jamnagar.This print was taken by an unknown photographer in the 1870s is part of the Temple Collection. The town of Jamnagar, Gujarat was founded by Jam Rawal in 1540 as his capital and was one of the most important princely states of Saurashtra. The town is almost entirely built of stone and is surrounded by a fort erected in 1788.